On 21 May the ECCT hosted a Special Lunch on the topic "What truly drives talent attraction and retention?" 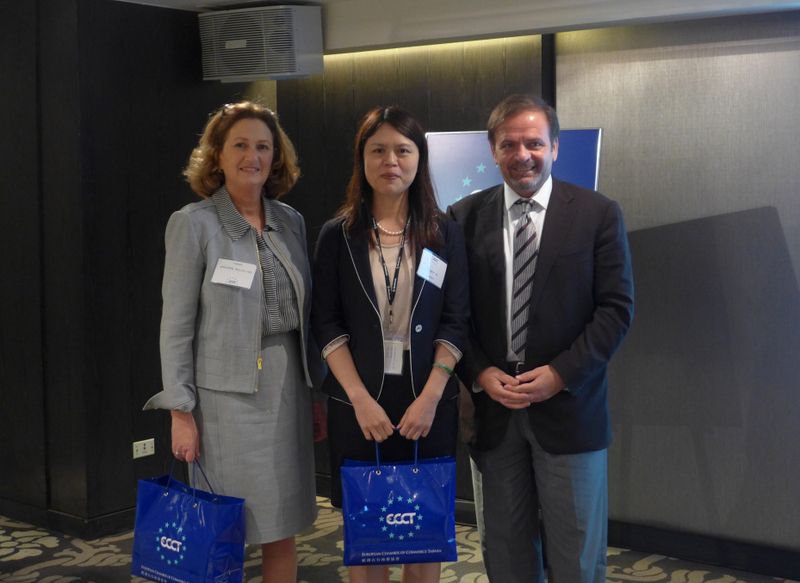 with guest speakers Christine Raynaud, CEO of MRI China Group (MRIC) and Maggie Wu, Senior Head of Human Resources and Corporate Communication, Medtronic. Christine Raynaud gave a synopsis of the main findings from the MRIC Group's "2014 Talent Report". Now in its fourth edition, the annual report differs from other executive search reports by capturing the moods, concerns and career plans of talented individuals (rather than employers). The latest report is based on the responses of over 5,000 professionals working across Greater China and Singapore, including 500 in Taiwan, of which about 25% are in junior management positions, 50% middle management and 25% senior management. The report offers clear insights into the ‘motivators' driving career decisions among mid- to upper-level managers. According to the report, 17.6% of respondents in Taiwan are not thinking about changing jobs while 64.4% are unsure and 18% said yes (they are definitely thinking about it). The number of people who answered yes is down from 23.5% in 2013 and 38.1% in 2012, indicating a more stable economic environment. Of the respondents, only 13.5% of those in the banking and financial sector answered yes while 26.6% of those in the consumer and retail sectors said they are seeking to change jobs, pointing to a higher dissatisfaction rate and likelihood of relatively higher turnover in the retail and consumer sector this year. On the question as to how talented individuals assess potential new employers, the most important factor for candidates is meeting with senior leadership, followed by the company's image, an interview with the hiring manager and the job description/ role brief. This indicates the need for business leaders to be more involved in the recruitment process, something which many leaders do not pay much attention to. Compensation continues to be the most important reason why employees switch jobs. This factor has increased in importance since last year. Other important reasons are better leadership and strategic direction, career advancement, a clearer career path and more benefits. While the need for a better work-life balance has become a less important reason for switching jobs over the past year, it is still the top motivator keeping Taiwan respondents in their jobs followed by compensation, opportunity to increase responsibility/challenges and company culture. The most desired relocation destination for Taiwanese respondents in the survey was Singapore, followed by Shanghai, [elsewhere in] Taiwan and North America but the popularity of Europe has risen over the past two years. Raynaud concluded by offering some tactical recommendations to firms based on the findings. Companies should add to the standard job descriptions (specify the context and challenges of the job) and actively involve hiring managers and senior leaders in the recruitment process. Regarding compensation packages, there should be regular benchmarking of market level salary and benefits practices. Finally, firms should make sure working conditions are flexible and considerate of special staff needs such as compensation for late work with extra leave, special leave for special events and the option for working from remote locations. The second speaker at the event, Maggie Wu, Senior Head of Human Resources and Corporate Communication in Medtronic shared some of her company's best talent attraction and retention strategies. To engage its employees, the company asks what employees want from the company through a survey. The key findings are consistently that employees want a promising future, a sense of belonging and recognition of their value.